Be bold and modern with this Abstract Foliage design from the Garden Collection. This pattern makes a statement with a floral design of pinks, greens and oranges. The design comes together with a simple white trim around all the leaves and swirls. A pink ribbon with white stitching attached to a decorative white label trimmed in pink ties the entire design together. 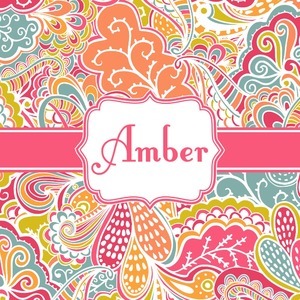 Add personalization of your choice in a coordinating color to make this pattern even more special.